A car crashed into the roof of a two-story home in the 500 block Palos Verdes Drive West in Palos Verdes Estates on Wednesday, Feb. 3, 2016. 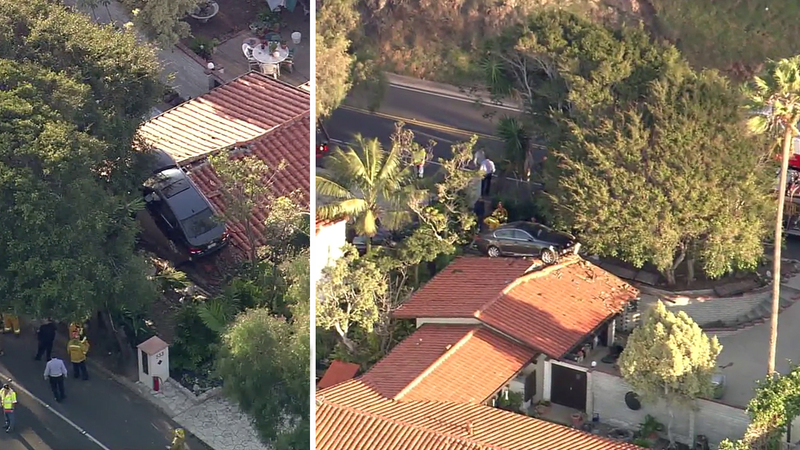 PALOS VERDES ESTATES, CA -- An out-of-control car launched onto the roof of a home in Palos Verdes Estates on Wednesday. Officials said the driver of a four-door Lexus hit two cars in the 200 block of Palos Verdes Drive West while traveling southbound. The driver continued and hit two more parked cars in the 500 block of Palos Verdes Drive West before exiting the roadway, according to police. Officers said the car traveled down a driveway where it hit another car before it launched onto the neighbor's roof where it came to a rest. Both the roof and vehicle appeared to suffer extensive damage. An Urban Search and Rescue team was at the scene determining if the structural integrity of the property had been compromised. Palos Verdes Drive West was closed as crews worked with a crane to remove the car from the roof, which appeared to be over the home's attached garage. The driver, who officials said was suffering from a medical condition, suffered minor injuries in the crash. There were no other injuries reported, according to police.